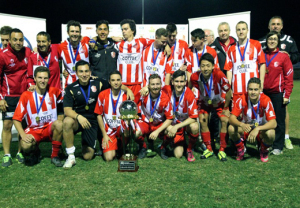 Olympic FC are the inaugural NPL Queensland Grand Final winners, fighting back from two goals down to defeat cross-town rivals Brisbane City on penalties at Goodwin Park on Sunday evening. Captain Danny Byrne was the hero for Olympic before a record crowd of nearly 4000 spectators – slotting a late penalty to send the game into extra time before again striking from the spot to secure the silverware in the shoot-out. The win secures Olympic the NPL Queensland Premiership-Grand Final double in the competition's debut year. Midfielder Nathan Bird opened the scoring for City in the first half prior to semi-final goal hero Ken Dougall doubling the visitor’s advantage from the penalty spot as the match neared the hour. City held the lead until substitute Matt Heath sparked the fight back with a header ten minutes from time; Byrne’s penalty followed five minutes later, before Japanese defender Katsuya Ito pulled the hosts ahead in the second period of extra time. A strong header from City captain Matt Biggins into the far top corner ensured the match would be decided from the penalty spot. Following a nervy start from both sides, City grew into the game on the quarter hour and appeared the team most likely when Nathan Bird opened accounts on 20 minutes – the midfielder delaying his run well to head in at the far post from Alistair Pase’s cross. Buoyed by the goal, City continued to create the best chances – Biggins seeing two attempts cleared off the line, while striker Daniel Sharov (replacing the injured Antonio Murray in the City line up) forced a sharp save from Olympic shot-stopper Mario Aparacio at the near post. At the other end, Olympic were uncharacteristically stifled in the final third by the City backline – in particular left full-back Cameron Tew, who marked promising winger Jai Ingham out of the game for much of the match. Tim Smits arguably missed the best opportunity for Olympic in the opening half, turning his header over the bar from 10 yards on an indifferent night in front of goal for the sharpshooter. Following the restart, Olympic fashioned several half chances only to be denied by a combination of poor delivery and desperate defending. But after only nine minutes, City doubled their advantage when Pase went down in the box under the attention of two defenders – semi-final goal scorer Ken Dougall sending Aparicio the wrong way from the ensuing spot-kick. The hosts continued to search for a goal, but it wasn’t until the introduction of Heath and Luke Howell with half hour remaining, plus a change of shape that saw Ingham switch to left wing, proved the catalyst for Olympic’s fightback. Nick Efstathis headed over the bar after rising well to meet Ito’s cross, before Byrne drew a full-stretched save from City custodian Matt Stein from 20 yards. Heath also shot wide twice before finding the target with a headed effort that mirrored City’s opening goal – the youngster timing his lunge to perfection at the far post from Byrne’s cross. Four minutes later, the significantly more involved Ingham drew a penalty from an ill-timed challenge from City centre back Luca Perico – Byrne converting the subsequent spot kick to level terms. Olympic continued to look the team more likely in extra time – Heath shooting wide from inside the area and Byrne forcing a save from Stein before Ingham saw a solid shot balloon off the crossbar. Smits finally shook off the attentions of City Perico to fashion a trademark header at Stein, but it was Ito who pulled the hosts ahead after the team switched ends, slotting home assuredly from a through-ball. Biggins’ reply came seven minutes later, the imposing Englishman surged forward to meet Korean midfielder Jae-Joo Young’s cross with a determined header that looped in to the far top corner. The penalty shoot-out was resolved quickly; Dougall unable to repeat his earlier spot kick at the death, before Aparicio denied Bird with a save to his left and Biggins fired his shot into the cross bar. Jack Petrie, Ito and Byrne all converted their penalties for Olympic to secure the dramatic win. Earlier in the afternoon, Brisbane City earned a consolation when they prevailed 4-0 in the Under 20 Grand Final over Toowoomba’s SWQ Thunder. Thuner’s Chris Hewson saw a penalty saved in the opening minute by City goalkeeper Kevin Downes before the match swung heavily in City’s favour. Matthew Riggs slotted the opener after running on to a well-weighted through-ball from Sam Wilkinson. Wilkinson then capitalised on an errant backpass to double the advantage with nine minutes remaining in the half. Wilkinson secured his double haul in the second half with a neat finish on the angle, before City sealed the result with a fourth in the final minute of the game to Bryce Cushieri. In the first of the Grand Finals, Queensland Academy of Sport were crowned Under 18 Grand Final winners after defeating Brisbane City on penalties. The scores were locked 1-1 following a back and forth 90 minutes – Academy opening accounts courtesy of Hayden McHenry before City levelled through substitute James Preskey midway through the second half. A cagey extra-time followed in the warm early afternoon conditions before the match was settled 11-10 in a long-winded series of penalties. The shoot-out proved controversial, with both goalkeepers adjudged to have left their lines to make stops, resulting in successful second attempts for both teams. Eventually, Academy shot-stopper Brandon Cuminao pulled off the first permissible save from Jarred Thomson’s attempt. Substitute Rees Duncan slotted the winning strike for QAS. More than 5000 Queensland football supporters attended the three Grand Finals in total, providing a ringing endorsement of the National Premier Leagues competition in its first season. "I've never seen a crowd this big at Olympic before," said Olympic FC Committee member Alannah Pearson, "It's even bigger than when the Roar were here last."